While waiting for our table at Amada during last year’s Restaurant Week, I spotted my first Philly celebrity. It was Aneesa Ferreira, of MTV’s Real World Chicago & RW/RR Challenges. When I tell you I love the RW/RR challenges, I mean I LOVE them. So when I saw Aneesa, I freaked out. However, lucky for me (NOT), Jordan told me to leave her alone and let her enjoy her night. After debating this in my head, I decided not to say anything. Afterwards, I tweeted to her telling her I saw her and how fab she looked. She replied (obviously) with: why didn’t you come say hi?! From that point on, I vowed to ALWAYS say hi. The worst that can happen is that they ignore me or call security, right? First up, Mayor Michael Nutter! I have loved Mayor Nutter since I moved to Philly, but especially after hearing him speak at the SocialMediaPlus Summit in 2011. We have tweeted back and forth a few times since I became a Philadelphian, and those twitter interactions are definitely one of a few select stories my parents fall back on when they tell their friends what I “do.” He was SO nice to take a picture with me – it made my night! 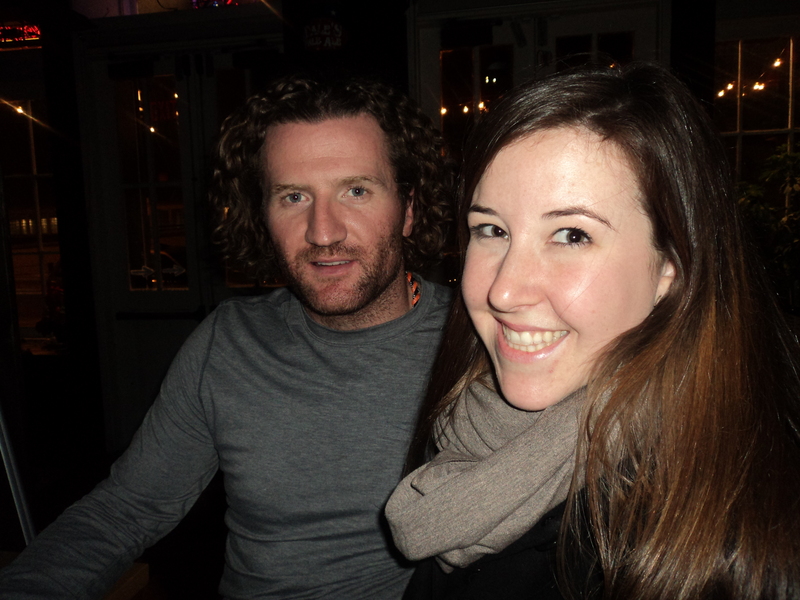 Only a few days later, I was blessed with standing this close to these gorgeous locks, belonging to none other than Philadelphia Flyers player Scott Hartnell! I was never into hockey growing up, but after some games at the Wells Fargo Center, I was hooked. The Fly Guys have become my team, and I am dying to get to a game this season. Get well soon Scotty! Finding new “people” when you move to a new city is tough. You have to replace the hair stylist, the doctor, the dry cleaner, and of course, the dentist. As most people are a little nervous about visiting the dentist to begin with, you definitely do your research before jumping right in. But, if you are in the Rittenhouse Square area, consider your research done! To find my new dentist, I started on my insurance company’s website and searched by location. Enter, Rittenhouse Dentists (1801 Pine Street). I loved that they were open after work two nights a week, so I made an appointment for a Tuesday evening teeth cleaning. From the start of my visit, I enjoyed my experience thoroughly. The friendly receptionist sent me away with a cool iPad in hand to fill out all of my medical info, which I loved. The waiting room had a Keurig machine and big, comfy chairs to relax in. I was taken back to be seen as soon as I was finished my paperwork. The dental hygienist had a Pandora station crooning John Mayer & Ray LaMontagne so I was instantly relaxed. I was offered a pillow for my head and a Paraffin Wax treatment on my hands while I got my teeth cleaned – which was, well, amazing. Two of my major complaints about the dentist are normally the bright overhead light and dry lips. The hygienist solved both of those problems with she gave me safety sunglasses to protect my eyes AND coated my lips with chapstick not once, but twice, during my cleaning. (Am I at a spa, or the dentist?) They were definitely taking every step to make my experience as painless as possible! When the doctor came in, she was friendly and to the point, which I appreciated. When I got home, my boyfriend definitely was confused with how relaxed I was coming from a dental appointment! 🙂 Overall, my experience was great and highly recommend Rittenhouse Dentists if you’re looking for a new dentist in the Rittenhouse area. Happy Monday! How lucky are we as Philadelphians that as we are hurrying around running errands, we get to look at the gorgeous, snowy Rittenhouse Park as our backdrop? The park is one of my favorite places in the city, and I love how beautiful it looks in the snow. In other news, we are smack dab in the middle of Philadelphia Restaurant Week! Last Friday, I went to El Vez with some friends from work. I took lots of pictures, so be on the lookout for a post on that! This week we have dinner at Del Frisco’s Steak House and Marmont Steakhouse. Make sure to follow @HerPhilly on Twitter for real-time updates and photos of my noms this week. A great way to use a small wall space and to build an “office space” upward. A fabulous idea to display your jewelry while covering some unused wall space. 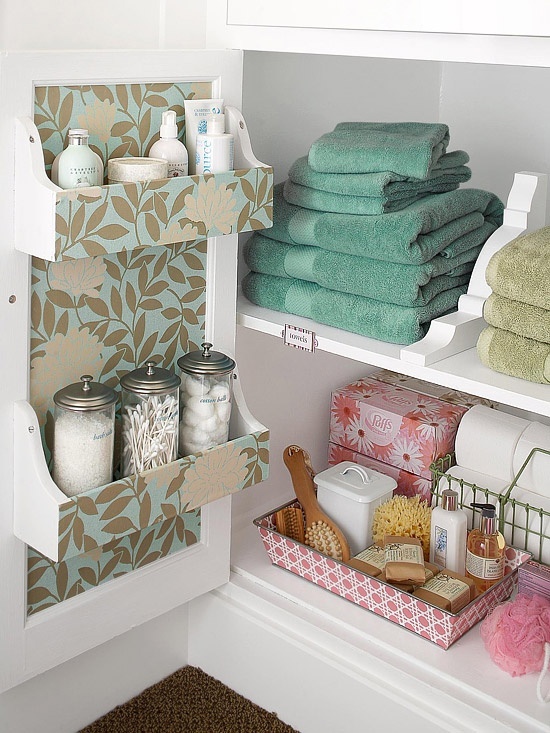 I have the space under my sink pretty close (but not as pretty) as this compartmentalized setup, and it is so helpful. Awesome set-up if you want to display things that are important to you while using them as organized-chaos storage. 1. Create a Realistic Budget (and stick to it! ): Being a relatively new “real person,” I am still getting this whole “budget” thing down 🙂 I will definitely be looking to the advice of LearnVest and some excel spreadsheets in 2013. 2. Establish a Workout Routine: I have a very sporadic way of staying active. I need to create a routine that I am accountable for. 3. Devote 3+ Hours a Week to Reading for Fun! I really love to read, and have always made time for it when I was growing up. But lately, my laptop & cell phone seem to be the things I reach for when I have free time, and that needs to stop! 4. Catch Up with Old Friends More Often: I am so guilty of neglecting chats with my BFFs. I recently read about the concept of the Five Minute Phone Call, and I think I need to start instituting that into my week. 5. Purge that Closet of Mine: This is a continuing “resolution” of mine. While I have no problem adding new items to my closet (see #1! ), whenever I go to throw something out, I suddenly have an urge to wear it. Not this year! Bye bye old clothes. 6. Stick to an Eating Plan: While some people may not like the whole low-carb diet craze, it worked for me as a lifestyle change. I lost some weight, and then I let my “cheat days” creep up way too often. I need to get back on track in 2013. 7. Volunteer: I’ve wanted to participate in Big Brothers Big Sisters program since my Dad did. While I think I still have a lot of figuring out about my own life to do (see: this entire list), this year I’d like to take the first steps to become a Big Sis! 8. Meet New People: The awkwardness of meeting new people when you’re out of college is tough, and not even seeing (let alone knowing!) the people who live in your apartment building also adds weirdness to the whole situation. This year, I vow to get out more & meet new people! 9. Cook at Least One New Recipe a Week: I have so many cook books. I’ve learned to sort of kind of like to cook. This is a must. 10. Thrift More, Spend Less: I don’t know why, but I am very intimidated by the Philadelphia thrifting scene. I love thrift shopping, but haven’t gotten into it as much as I’d like in the city. If anyone has any tips, send them my way! 11. Send More Cards: When Jordan & I first started dating, we lived an hour away from eachother. I loved surprising him with a card in the mail a few times a month, and he loved getting them! I need to jot down more REAL addresses & send more cards! 12. Grow My Blog! I can not even tell you how excited I am about Her Philly, and about all of the other awesome bloggers in Philly. I am looking forward to meeting my fellow bloggers and getting involved in all of the awesome events. 13. End Each Day with a Little Prayer of Thanks: I always feel better about my day when I give myself a little time to reflect each evening before I fall asleep. Simply saying “thank you” truly puts things in perspective for me, and I think doing this daily will be good for me. What are some of your resolutions for the new year? I hope everyone has a fun & safe evening tonight … and wishing you a happy & healthy 2013! I was really trying to hold myself to a blog every other day, but it seems the holidays let that get away from me. Here are some of my favorite moments during the time I spent in South Jersey during the my favorite season! Christmas Eve is becoming one of the best days of the year for me. My sister & I get to exchange our gifts, we go to a great party with good friends, and finish it off with the 10pm candlelight church service. This year, Lindsay got me a massage at AVA Wellness, and I can’t wait to use it! My dress is the Harlow Faux Wrap Dress by Kiyonna from a fabulous new rental service I am trying out, Gwynnie Bee. If anyone would like a review of their service, let me know! On Christmas morning, my family & I opened gifts, made a yummy breakfast, laughed, and spent some wonderful quality time with each other. Don’t let this photo of the sleeping Ellie fool you, she was a maniac with all of the wrapping paper and boxes on the floor. One of my favorite gifts was presented like this (a stunning photo of the Trunchbull courtesy of my mom) … tickets to see Matilda on Broadway! Christmas dinner was delicious and fun as usual. My Aunt Edie is a Pinterest pro and she makes the most amazing apps & drinks from recipes she finds there. This is her second time whipping up some sangria, and it was awesome. We finished dinner with a celebratory Christmas shot of Three Olives Chocolate, and let’s just say, I’ve found a new Three Olives vodka to add to my existing stash of Cherry. We also enjoyed our time with our neighbors during our annual get together. Our “Chinese Auction” is always the most fun, and to my surprise, the hottest gift this year was Chuey, a stuffed Chihuahua that sings La Bamba (which Jordan got me as a gift once… and I might have put him in the donation pile last month… and my mom might have taken him out for this game… and Jordan was the one to open him. Oops.). Everyone meet Ellie, my sister’s early Christmas present. We’ve never had a dog before, and she is absolutely perfect. Within an hour of meeting her at my parent’s house this holiday season, I had about 50 photos of her on my phone. Plus, Ellie obviously loves reading Her Philly 🙂 Happy Holidays everyone!